HaptX teamed up with Nissan to enhance their vehicle design process. 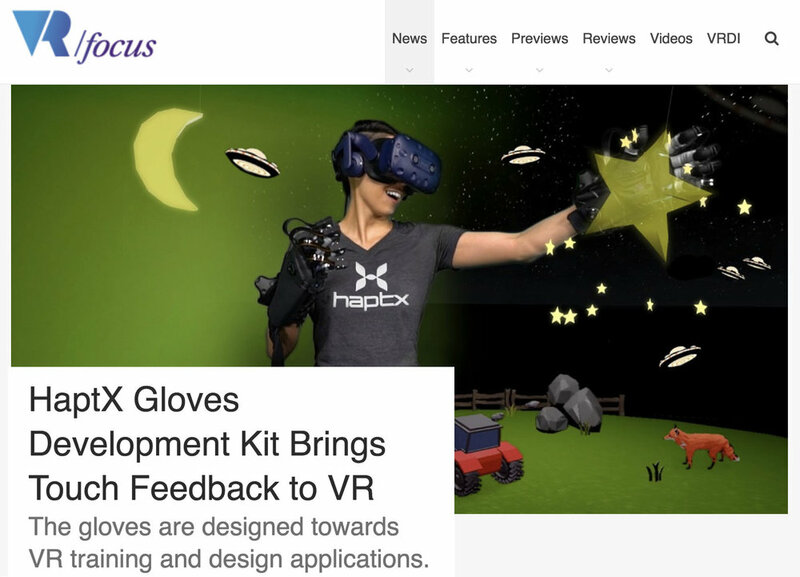 Their designers use HaptX Gloves to touch and interact with 3D models virtually, enabling immersive design reviews that would previously require costly full-scale physical prototypes. The partnership received great coverage from Digital Trends, VentureBeat, and VRScout. I shot and edited a video to show our design tool in action. 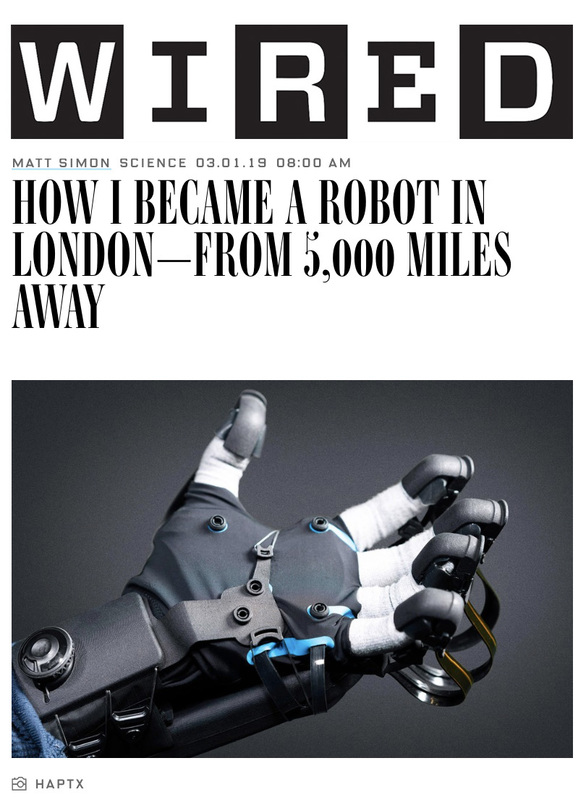 HaptX collaborated with ANA, SynTouch, and Shadow Robot Company to develop the world’s first haptic telerobot hand to deliver touch feedback across the Atlantic. I led the media strategy among the four companies involved, which led to a prominent piece from Wired. Read more about the haptic telerobot in this blog. In the month preceding our HaptX Gloves Development announcement, we demoed and interviewed several journalists under embargo. 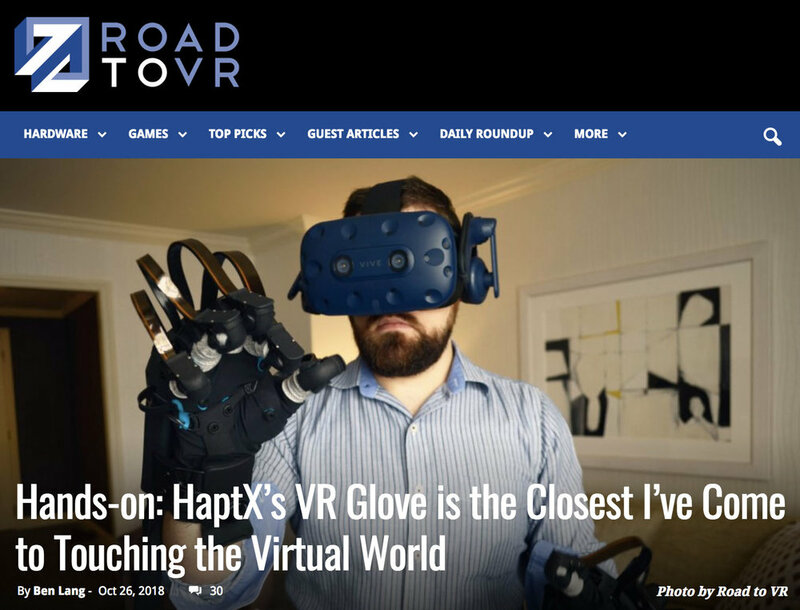 On launch day TechCrunch, Axios, VentureBeat, GeekWire, Road to VR, Forbes, Upload, VR Scout, and VR Focus wrote first-hand accounts of experiencing our gloves. We coupled this press with two events: The Future of Storytelling Summit in New York City and the GeekWire Summit in Seattle. Outside of experiencing HaptX Gloves first-hand, we’ve found that video is the best medium to communicate how they feel, what they enable, and why they’re special. When we announced the HaptX Gloves Development Kit, our video trailer was a key ingredient to spreading the word. You can read my full post about producing this mixed reality trailer here. We launched the HaptX Gloves Development in October of 2018. We took this opportunity to overhaul our website, with product-focused imagery and a call to action to “Get early access.” I created new imagery of our DK gloves, pairing them with copy that highlights key selling points of our product. The Wall Street Journal is the pinnacle of business reporting in the United States. When we visited New York City for the Future of Storytelling Summit last fall, I met with WSJ technology reporter Sarah Needleman to share our story and give a demo of our technology. This meeting led to a terrific piece in the WSJ's quarterly magazine, The Future of Everything. Good PR takes time. I originally connected with Sarah two years earlier, when she replied to a tweet about our company (then known as AxonVR). She described our tech as, "so Ready Player One!" It's fitting that Sarah waited to share our story until a few days after the film's release. That way she could attach it to a broader narrative about the real life technology that's making Ready Play One a reality. We received similar coverage from Variety, Forbes, and IDTechEx. This shows how closely intertwined social media, public relations, events, and mass media narratives work together in marketing. I worked with Smarter Every Day (SED) creator Destin Sandlin to coordinate a visit to HaptX's San Luis Obispo engineering lab. SED has a base of 5.6M subscribers, many of whom are engineers. This was an opportunity to drive recruiting and build awareness among a tech savvy audience. The opportunity came with considerable risk: Destin is a vocal skeptic of virtual reality. He'd be doing an on-camera demo of our VR glove prototype, so there was a possibility he'd trash our technology in front of his 5.5M subscribers. However, we believed our glove would turn Destin into a VR believer. Turns our we were right. The video skyrocketed to the front page of r/videos and to the front page of YouTube. It wound up being the #7 trending video for the day. 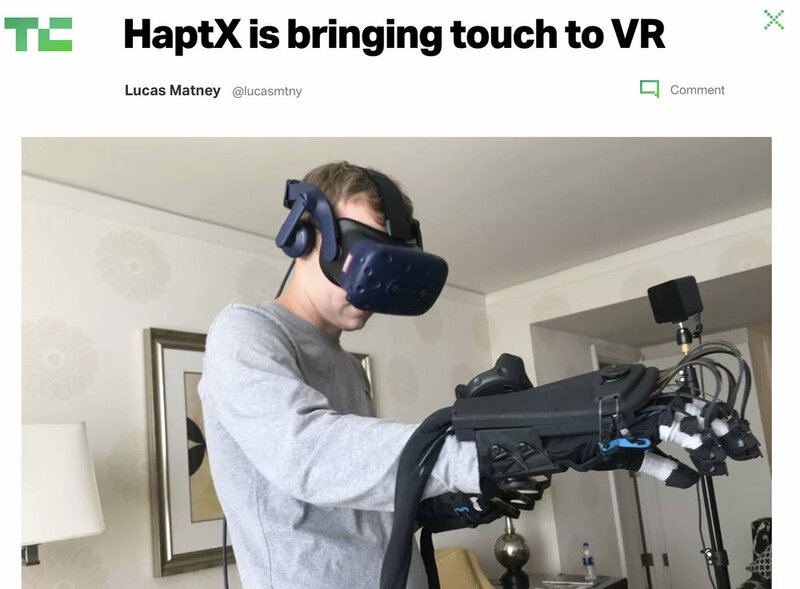 Some outlets even covered the video, highlighting that the HaptX Glove turned Destin into a VR believer. Right now the video is hovering at 1.25M views. Screen capture of YouTube's home page. We peaked at the #7 trending video worldwide. Destin liked the video so much, he did something unprecedented for his channel: he released a follow-up video about our company. His follow up video featured another one of our demos, and interviews with members of our engineering team. It received over 600K views. When the Sundance Institute selected HaptX as an official selection of their 2018 festival, it presented a tremendous opportunity to launch our startup company to new heights. 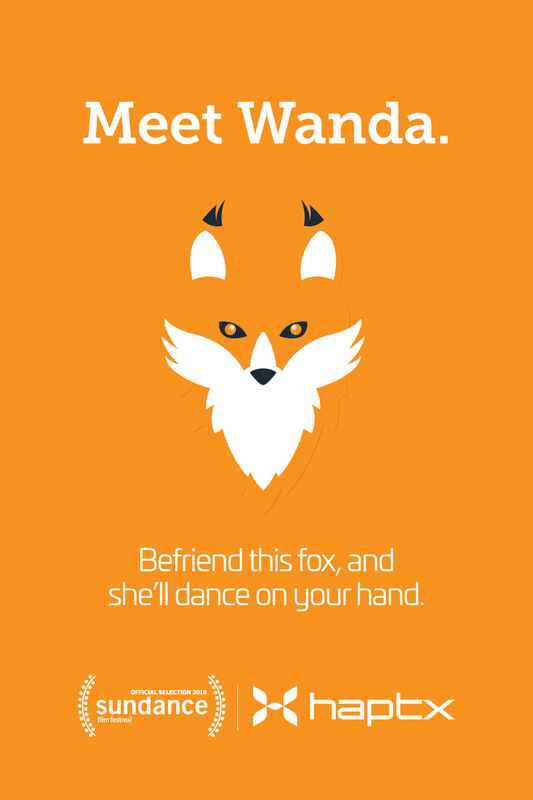 However, Sundance presented a unique marketing challenge: the festival organizers wanted to promote our experience, but not our company. An example: They didn't want us to put our company name or logo next to the experience. They didn't want their exhibit space to feel like a trade show. This makes sense when you think about movies. The marquee will show the name of the film, and perhaps the lead actors and directors. It does not list the studio nor distribution company. The solution: a series of posters to highlight the story and interactions of our VR experience. These posters snuck in our company name and logo without feeling garish, and provided a splash of our brand colors. I kept this as a low budget project: I personally designed the posters in about a week's time. The printing, mounting, and shipping collectively cost under a thousand dollars. These went a long way: In addition to branding our demo space, we plastered the posters throughout Park City. We shared them on social media, and gave a limited number to VIPs who tried our demo on opening weekend. Although HaptX a B2B company, I knew that Instagram would be a major social media platform among influencers at the festival. For this reason, I created our Instagram account weeks before Sundance, and populated it with our posters and branded artwork. We wound up getting tagged in posts and stories from people including The Black Eyed Peas, Mike Shinoda of Linkin Park fame, and comedian/musician Reggie Watts. People loved them so much that we repurposed them for events like SXSW. We have the original Sundance posters hanging in the entry to our office. Screen capture of HaptX's Instagram. It's not an exaggeration to say that the latest wave of VR started because of the Sundance Film Festival. Oculus founder Palmer Luckey interned with the Sundance Institute when he was in college, and the first Rift prototype made its debut at Sundance 2012. New Frontier, the VR program at Sundance, contacted us mid-2017. They select a dozen or so art pieces, and select one new technology to showcase each year. I lobbied hard to make sure HaptX would be the featured technology for 2018. We succeeded. When HaptX debuted two pieces in the program, and I sought to maximize our marketing impact to elevate our startup to new heights. As a former filmmaker, it was a dream come true to be listed as a lead artist on our project. I scripted the story of our glove demo, and had a creative hand in our thermal demo content. That said, everyone in the company deserved a credit. The HaptX Glove marked both the public premiere of the haptic glove and the first hardware product to debut at The Sundance Film Festival since the Oculus Rift in 2012. Our glove, along with the image I created was on the front page of Variety, Criterion, and Sundance.com. The Verge listed us among the best of the fest. CNET raved about us. Leading VR outlets covered our glove. Voices of VR interviewed Jake Rubin (CEO) and Joe Michaels (CRO) of HaptX. CNET gave us a stellar review. We earned new investors and business development leads. To succeed in marketing a startup, you must always punch above your weight. We've done this successfully with HaptX when it comes to awards. The Advanced Imaging Society recognized HaptX among its 2018 Technology Award (Lumiere) Winners. We were honored alongside major companies like Microsoft, Technicolor, Google, Marvel, and Dolby. In December 2017, we were honored as one of the GeekWire Seattle 10. We’re listed alongside companies like Amplero, Blokable, and Vicis, who have raised significantly higher rounds than we had. We created a giant cocktail napkin to pitch our startup, which is now stored in the Museum of History and Industry's permanent collection. In addition to the Seattle 10, GeekWire nominated HaptX as a finalist for 2018 Hardware of the Year. HaptX is where the real world and virtual world collide. We developed an aesthetic of 3D objects in real-world environments. I created most of our images myself with a combination of the Unity game engine and Adobe Photoshop. The images below are featured on haptx.com, animating along with key selling points as the user scrolls. We achieved this animation effect through a creating a sequence of images. We included the object wireframes to speak to our tech-savvy audience of VR developers, and to create a distinctive look. This art direction lends itself to animated gifs, which we used throughout our website and on social media. We produced a video as a central component to launching the HaptX brand. The goal: show the potential of our technology, and the key use cases and differentiators of our product. We worked with Cinesaurus, the team behind Gritty Reboots and Job Hunters. They've done stellar work with big clients like Deloitte and SpaceX. When we rebranded from AxonVR to HaptX, we created a full new website. We created wireframes, images, and messaging in-house, and worked with Rotator creative on the development, functionality, animations, and graphic design. We designed the video to work as a looping reel on the haptx.com home page. Given that our company was pre-product, we built haptx.com around the call to action "Contact Us." This CTA drove thousands of inquiries from investors, customers, media, and influencers. I used the rebrand as an excuse to work alongside creatives that I admire. 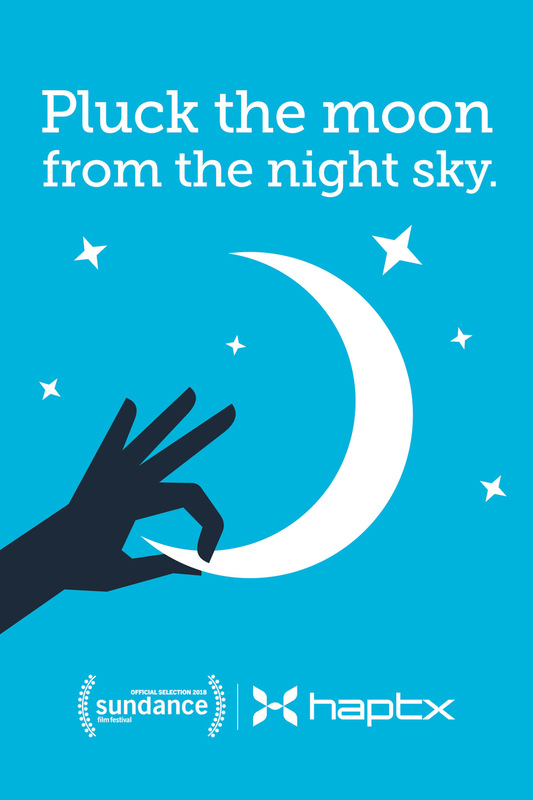 Rotator, who did our logo and website, is a tremendously talented design and branding team in Tacoma. Not only do they create stellar work for their clients, they craft and spread art that builds their community. 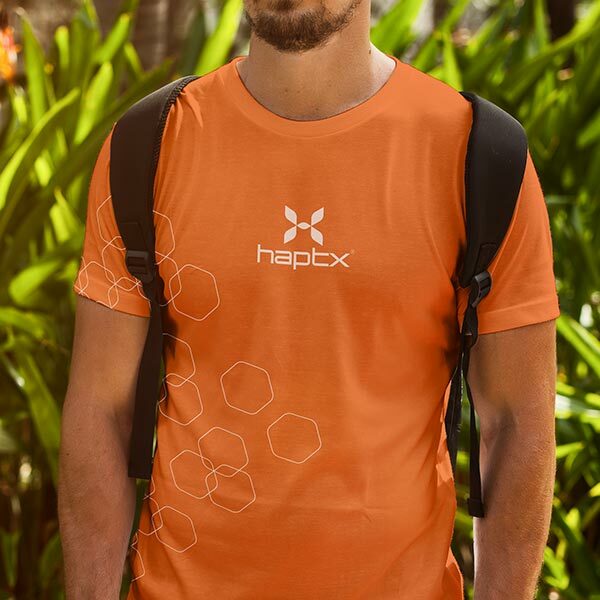 The logo is a central element in HaptX’s visual communications. Through consistent and repetitive use, we hope the logo will be a shorthand which identifies our brand. Our logo is simple, recognizable, and distinctive. The logo contains two pieces: the mark and the name. The mark resembles an H and an X, with four points that allude to the four dominant modalities of haptic feedback. The name is h-a- p-t-x in lowercase, maximizing legibility and simplicity. The strokes are of one width, evoking qualities of unity and technical precision. The angular typeface contrasts with the rounded, organic shape of the mark. The hidden arrow in the negative space of the “t” and “x” points forward, indicating that we are a forward-looking company. This is how Rotator describes the design thinking: The full spectrum of touch includes tactile, force, vibration and thermal. These are the differentiating factors that HaptX brings to the VR industry that sets them apart from other companies. Most companies focus on the virtual world with a visual only solution or maybe one or two of the four elements. This is where Rotator started diving into each one of these categories to find how the HaptX technology handled them. From discovery to the final brand, we needed to capture this essence and provide a solution that the company could build on as well as fit nicely into the industry they wanted to help define. HaptX technology is pretty intense so it would be easy to push this in a direction that most sci-fi movies tend to go. We needed to keep the human factor alive and strong so we made sure to also focus on what we called “The Organic Future”. This meant that our end result needed to feel like a living breathing entity but also encompass a modular feel that could lend to the strength of what the core of the company focus was. When I read Shoe Dog by Nike founder Phil Knight, I was surprised to learn that for the first 15 years of Nike's history, the iconic company was called Blue Ribbon Sports. The initial change to Nike was unpopular. People thought it would be pronounced with one syllable, so it rhymed with "like." Knight's general guidelines for an iconic name: keep it to one word and ideally two syllables. Many of the most valuable brand follow these rules: Apple, Google, Facebook, Samsung, Tencent, Intel, Pepsi. Knight also advised to include a hard consonant sound if possible. The "ex" sound is a memorable consonant. Think of Kleenex, Xerox, SpaceX, FedEx, Exxon. I followed these guidelines when renaming our company from AxonVR to HaptX, (pronounced "hapt-ex"). It met Phil Knight's criteria, and it evokes extending what's possible with haptic technology. Additionally, I made sure that the trademark and domain name were available. Once all things were aligned, we committed to the new name. Record of HaptX's trademark, filed one year before we changed the name of our company. I produced this reaction video to show the amazing responses AxonVR gets from its technology. This demo from AxonVR led to fantastic press from The Verge and IEEE Spectrum. We earned about 40k views on our original video, while repostings of this video across YouTube and Facebook earned millions of views. When I joined AxonVR as their first marketing hire, I had a lot of work to do. After a few months of planning our marketing efforts and learning about the space, we developed and articulated a brand identity. 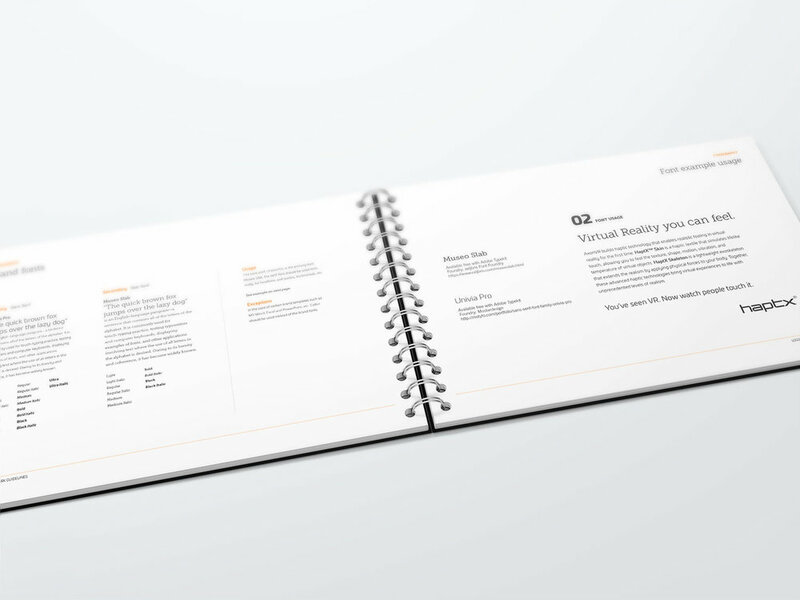 The AxonVR Brand Book codified our visual identity, positioning, and messaging. It enabled the brand to scale to the rest of the company and to third-party vendors. Part of the AxonVR brand was developing a distinctive visual style. We focused on full-body experiences and interactions related to the hands. We used fine particles like powder, film grain, and small stars to convey a sense of precision. We flooded these images with cyan and magenta to make them stand out in a crowded space. 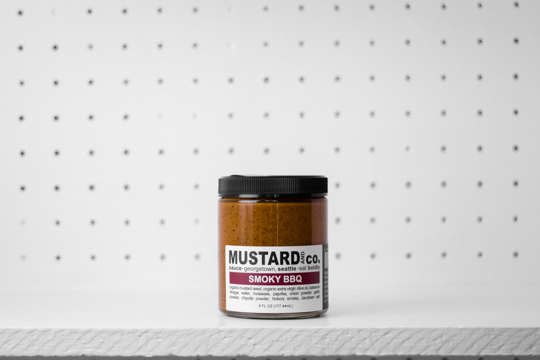 Launching an e-commerce business: Mustard and Co. I met the duo behind Mustard and Co. at a craft fair in Seattle in mid-2015. They were the most popular stand at the festival, with people lining up to try their mustard. I loved the the mustard, so I bought a few jars and asked them about their business. They told me they like craft fairs and street markets because they're selling direct to consumers. They were carried in a few stores and online market places, but distributors and retailers took the majority of their margins. I saw an opportunity. In late summer 2015, I joined Mustard and Co. on a contract to accelerate their online presence and e-commerce business. The goal: to launch for prior to the 2015 holiday season. I led an overhaul of their website on the Shopify platform. After revamping Mustardandco.com, the next step was to drive traffic. I achieved this through optimizing SEO, and performing paid ad campaigns on Google and Facebook. I created new photo and video assets, launched them on Twitter and Instagram, and executed an influencer marketing campaign. I even advised them on developing a new holiday product designed for online buyers. For the first time, the majority of their profits came from online sales. Above: Screen captures from Mustard and Co's website. Left: Mustard and Co's Instagram featuring pictures from when I led their marketing efforts. Below: A video I produced to tell their company story. The solution: The Five Flavor Gift Set. The Five Flavor Gift Set contains one of each flavor, in 2oz mini jars. The customers could purchase the set for $20. They designed the 7oz jars were designed as a pantry ingredient consumed by an individual customer. I designed the 2oz variety packs to be a party/holiday gift that could be consumed by a group. This way many people could try it their flavors, turning mustard into a social activity. We used packing tubes to ship the jars safely, so we embraced this as the design of the package. It makes for a distinctive looking gift. I led an influencer marketing campaign to tap into new audiences and spread the word about Mustard and Co. I researched leading foodies, chefs, and lifestyle bloggers, targeting those with audiences in the low hundreds of thousands. The kinds with reach and impact, but with a higher likelihood of actually responding to us. I mailed packages and sent personalized messages to each of them. This was a time-consuming effort, but it paid huge dividends. Tiffani Amber Thiessen, the actress best known for Saved By The Bell, was among those I contacted. She listed us at the top of her holiday buyers guide for 2015. Food bloggers wrote recipes that called for Mustard and Co mustard. We cross-posted them to our blog and recipes page, and amplified these posts on our instagram. Below: Pictures from food bloggers' recipes. 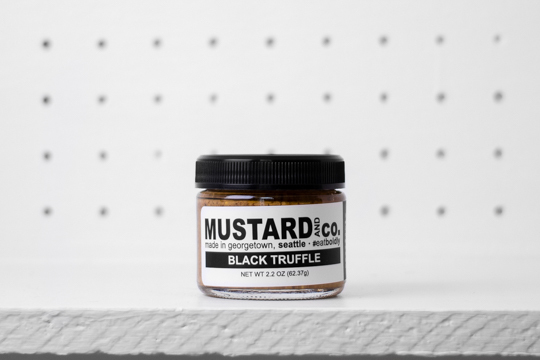 The team behind Mustard and Co. launched an online marketplace for other independent food labels called Stocked General Store. I shot their products in a consistent manner to ensure consistency. I have a new appreciation for the level of OCD required to conduct a proper product photoshoot. Russell Investments' CEO asked our team a snazzy new brand video just weeks before a conference. Our go-to video agencies were unavailable, even though we had a $100K production budget. I saw an opportunity. I lobbied our Creative Director for us to do this video in-house. I would direct and edit the video, and work with one of our art directors on motion graphics. I assembled a production team, and co-wrote and directed the video, keeping the total budget below $30K. We met our deadline, and it was used at Russell's conferences over the next 15 months. The Content Marketing Awards recognize the best content marketing projects, agencies and marketers in the industry each year. The 2018 Content Marketing Awards include all aspects of content marketing, from strategy to distribution, from design to editorial. The Content Marketing Awards program is the leading international awards program for corporate content creation and distribution. My work with Russell Investments received Best News Series or Program for 2015. The series: Market Week in Review, a weekly update that I produced and published every Friday. It recaps the week's events and looks ahead at market news. Past CMI winners include Ikea, REI, and Zillow. When I joined Russell Investments, I learned the company sent new associates to an external photo studio to get their portraits taken and retouched. Executives and sales reps would go to these photo studios once every few years. As a company with more than 2,000 associates, this cost a lot of money: $80,000 a year in addition to executive travel time. For a few thousand dollars, I set up a professional photo studio in Russell’s headquarters. This saved Russell a significant chunk of change, and saved people time. I wound up taking and editing headshots for over 600 of my colleagues. This taught me a great deal about photography, lighting, and working with people to make them feel comfortable in front of the camera. For two years, I was Russell's go-to photographer, snapping and retouching photos for brochures, PR, events, and marketing collateral. When I was 19 years old, I managed the new video department at The Daily of the University of Washington. I hired a staff of eight students, and we produced web videos five days a week. We partnered with UWTV to turn this content into a weekly 30-minute news magazine show called Double Shot. This was the first student-produced content to air on the network. I managed a staff of 15 student journalists, some of them twice my age, to meet our weekly deadlines. I produced 18 episodes of Double Shot in its first season in 2010. It would go on to run for another six years. I won a Seattle Addy Award for the three 30-second TV-spots I produced for this series. I went on to write, produce, and anchor segments (1, 2) for UWTV's flagship program, UW360. I produced videos for orientation, commencement, and other promotional materials for the UW. While it can be cringe-inducing to see my college years captured in glorious 480i resolution, this experience taught me valuable lessons in leadership, project management, public speaking, and storytelling. Prior to going to getting my Master's Degree and broadening my marketing skillset, I was laser focused on visual storytelling through filmmaking and photography. This page is long enough already, but if you're interested in seeing this work, you can visit my video portfolio and my photography collection.